Janice James’s house as it looks today. Janice James sits at her kitchen table in front of a jam-packed manila folder filled with highlighted newspaper clippings, City documents, photographs, and regulatory guidelines for the City of Kansas City, Missouri. The folder contains a slow-motion timeline of an incontrovertible fact: her roof is collapsing. Just a few steps away, in a nearby room, is a plastic children’s pool with a large bucket in its center. The bucket is filled to the brim with unsightly brown water, which steadily drips from the ceiling through a hole that was once filled by a light fixture. The chimney fell off the roof last year, and what’s left to protect the interior of her home is at best a band-aid solution: tarps strategically placed around the roof to protect the areas most prone to the elements – though alarming gaps remain apparent from the exterior of the structure. Rain water cascades into the second story of her home through those gaps; James estimates that she has six or seven crates full of standing water on the second story. In a nearby closet, mold has begun to form on the ceiling. With each passing rainfall, the situation becomes more dire. This is no way to live, and while James hasn’t exactly grown accustomed to it, she’s learned to manage. After a twisting, three-year saga that has led James to this point, the hope is that she won’t have to manage for much longer. The City is currently working to identify funds for a costly roof repair. Some estimates for the project have exceeded $60,000, though workers still need to inspect the full scope of damage in order to pinpoint a final cost. 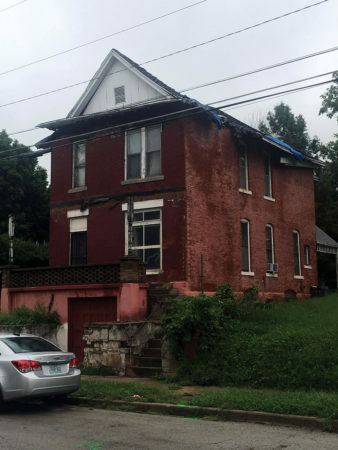 As one City staffer suggested, the project would essentially be the “Super Bowl of extreme home makeovers” – an essentially unprecedented scope for a City-funded minor home repair investment. That fact has led to resentment, both inside City Hall and amongst neighbors who wonder why James is getting special treatment. At the root of this resentment, it seems, are remnants of the burned bridges of yesteryear. James is an enigma – vacillating between rational and conspiratorial, desperate and defiant. She’s as prone to fits of fear as she is to pointed barbs, and holds long-standing grudges against the individuals and organizations that have tried and failed to help her fix the roof. In some ways, this is a story about a woman from Northeast Kansas City whose quest to fix her dilapidated roof has reached the highest echelons of City Hall. James’s case would never have gotten this far without her unwavering persistence, though that trait has undoubtedly served to her detriment, as well. She’s impossible to please, impossible to ignore, and at times unreasonably demanding. She also has a point. The tale of Janice James’s roof goes something like this: she bought the home from her ex-husband several years back for just $5,000. James was initially drawn to the idea of returning because she was on disability and living on a fixed income. Knowing that the roof needed repair, she applied with the City for a minor home-repair grant. At the same time, she applied with the City to fix some electrical issues at the home. The City approved roughly $2,500 in electrical work through its existing grant programs, but forwarded the roof repair to Westside Housing, who green-lit the project and hired a sub-contractor for the job. Materials were even shipped to the house, but there was a snag; the sub-contractor refused to get up on the roof. The rafters were pushing it out, and bricks were falling with it. In short, the roof was in the beginning stages of a full-on collapse. For weeks the materials sat on James’s lawn while Westside Housing scrambled to find a solution, but the cost of the project was soaring. Ultimately, nothing ever happened. The materials were eventually picked up and hauled away, much to the chagrin of a devastated James, who lashed out at Westside Housing in the wake of the disappointment. To this day, the topic of Westside Housing gets James’s blood boiling. She tosses around the idea of a lawsuit, and laments the reminder of a past injustice that has led her to dire straits. Westside Housing disputes the cost estimate, suggesting that the price had ballooned to over $20,000 by the time they pulled out of the project. Still, as the City considers a costly repair to save the home, the organization acknowledges that it’s the right thing to do. It’s a historic house, James is elderly, and she meets the income guidelines. The remaining hang-ups are the escalating costs and continued personality clashes with James. By late summer of 2018, it’s hard to identify which issue is a bigger detriment. 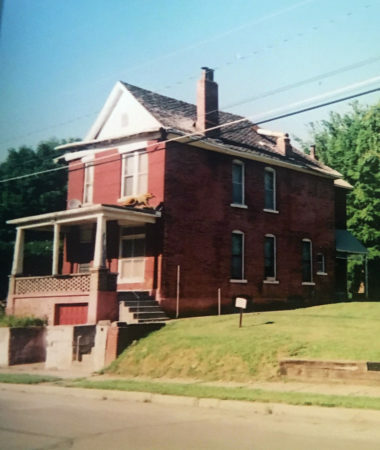 James’s grievances run deep, with equal ire directed towards the massive – a failure to repair her roof three years ago – and the minuscule; coffee that’s too cold, doughnuts too stale, even assistance from someone wearing the wrong color of shirt. “She told me, quite frankly, that she was very upset that Steve Reynolds with the City showed up with Marlene Dade, and he was wearing a pink shirt,” Ortiz-Fisher said. The result of this type of ire is that the list of people who have pledged to help James is hardly longer than the list of those who have sworn her off for good. Through it all, however, James remains vigilant. In her eyes, the City failed her when the grant funding dried up two years ago. Why should she trust them now? At every interval, there is a hang-up. On August 15, the front porch collapsed, prompting a massive response from the City. James initially refused to leave the property, but was eventually convinced to temporarily stay in KCFD’s children’s safety trailer while the home was being evaluated. Deputy Fire Chief Jimmy Walker made the call to the City’s Dangerous Buildings department. Despite the decision to spare James’s home from the Dangerous Buildings list, bricks from the dilapidated roof continue to fall onto the concrete walkway that hugs the southern exterior wall of the home. Time is of the essence, and James seems to understand that fact. Part of what cripples her decision-making process is a deeply-held fear that this entire endeavor will end with the loss of her home. It’s why she hates the notion of moving to temporary housing, and why she agonizes over signing a deed of trust. James’s concerns are not without merit. Still, after roughly two years of radio silence, James began re-engaging with the City again in May of 2018. The Municipal Court Fund said that they could help her, but they didn’t have enough money. So they made a move to partner with the City Home Repair Program, funded by HUD. “I think she spoke to pretty much everyone at City Hall who had the ability to listen to her,” said Steve Boniello, Weatherization Program Manager with the City of Kansas City. James wasn’t even supposed to be eligible for the program, because she received assistance with her electrical box in 2015. Funds from the City Home Repair Program (50% of median income by HUD guidelines) were used to install a 200-amp panel in her basement. However, as circumstances have shifted, the City made a judgment call to waive that requirement to move forward with repairs. At least, that was the intent. But with both sides presently at an impasse, the process has once again stalled. Stuart Bullington, Senior Planner with the City of KCMO, says that staff is still waiting on permission from James to enter the premises. Bullington also voiced concern about the methods James is using to draw attention to her case. Issues have also emerged related to the deed of trust, which is non-negotiable from the City’s perspective. The agreement would protect the City’s investment in the event that James moves to sell the property within a certain time period following the renovations. Part of James’s hesitation, she says, is that there is presently no definitive timeline attached to the deed of trust. She has continued the conversation with Boniello about that issue, and in his discussion with the Northeast News, he acknowledges that her concerns are legitimate. In most instances, he says, a deed of trust becomes forgivable after five or 10 years. “From what she’s described to me, I understand completely where she’s coming from,” said Boniello. Sitting at her kitchen table, in front of that manila envelope, James still won’t – or can’t – let go of her past grievances. In one moment she conveys a desire to sign the deed of trust and get the project back on track, and for a moment, she acknowledges some level of personal accountability. In her obsession with the past, James threatens her own future. The lingering frustration may be justified, but so is that of the City workers who have been bending over backwards to make things right. The irresistible force has met the immovable object.